“It was a little bit of a slow start after so many months out of the ring,” says Keith Thurman of training camp, “but I’m feeling great as we get closer to the fight. I’m starting to feel more and more like a world-class athlete again. It’s a good feeling working this hard and it reminds me what it’ll take to continue being the champion.” After close to two years out of the ring, the 28-0 Thurman will be returning this Saturday to face the 36-7-0 Josesito Lopez at the Barclay’s Center in Brooklyn, New York. The card will start airing live at 8 PM Eastern Standard Time as part of the PBC on Fox and Fox Deportes. “I don’t think ring rust will be an issue,” the Florida based Thurman says. “The only thing that even if this may not be the best Keith Thurman that people have ever seen, we’re focused on getting better and much stronger with each fight. 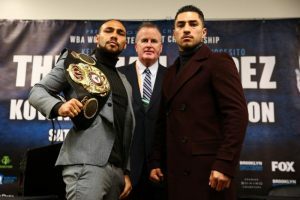 But make no mistake, people will see one of the best welterweights in the world on January 26 at Barclays Center.” Thurman, who has been healing from an injury, actually gave up his WBC welterweight title, though he still holds the major WBA welterweight strap, which he will be defending against Lopez on Saturday.